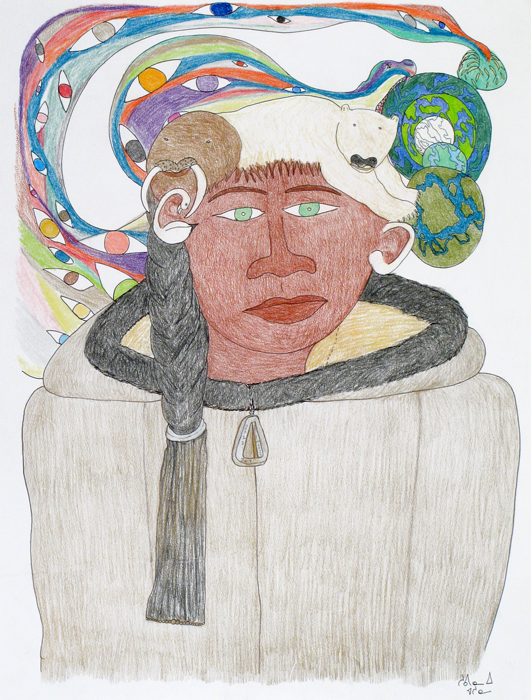 Feheley Fine Arts is pleased to present a new exhibition of drawings by Cape Dorset artist Shuvinai Ashoona at Centre Space. The World is a recurring theme in recent work by Shuvinai Ashoona. 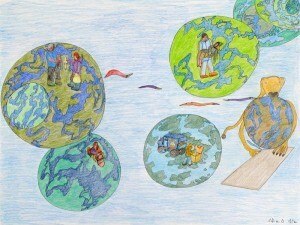 Her drawings often depict multiple images of planet earth. This exhibition presents her exploration of time and space, local and global issues through this series of drawings. There will be a Gallery Talk on September 22, 3pm as part of the Gallery Hop Toronto, organized by the Canadian Art Foundation. Curator Nancy Campbell will be in discussion with artist John Noestheden who completed a major collaborative project with Shuvinai Ashoona in 2008 that became the inspiration for this series of drawings. Shuvinai Ashoona was born in Cape Dorset, Nunavut in 1961. Her artistic heritage is considerable; she is the granddaughter of renowned graphic artist Pitseolak Ashoona and the daughter of sculptor Kiawak Ashoona. This is her second solo exhibition at Feheley Fine Arts and her first in Centre Space. An illustrated catalogue will be available. Her work has been featured in group exhibitions across Canada as well as in the United States and Europe. Exhibitions in public institutions include Shuvinai Ashoona and Shary Boyle at the Justina M. Barnicke Gallery, Hart House, University of Toronto; Oh Canada, Massachusetts Museum of Contemporary Art, North Adams; Inuit Modern, Art Gallery of Ontario, Toronto and Sanaugavut: Inuit Art from the Canadian Arctic, National Museum, New Delhi. Carleton University Art Gallery has recently published a monograph on Shuvinai Ashoona which serves as the catalogue for their 2009 solo exhibition of her work. Her drawings are included in the collections of the Art Gallery of Ontario, National Gallery of Canada, McMichael Canadian Art Collection, Toronto Dominion Bank Group and numerous private collections. Earth and Sky, the collaboration with artist John Noestheden which sparked this new series of drawings was commissioned for a city block-long installation inBasel, Switzerland in 2008. Shown in banner form during the 2008 Nuit Blanche and at the 2012 Sydney Biennale, it will again be exhibited in Spring 2013, mounted over the impressive entrance path to the National Gallery of Canada. The original collaborative drawing is in the collection of the National Gallery of Canada. From her earliest works, the art of Shuvinai Ashoona has been informed by the influences of community, history and personal experience, and the spiritual connections made through memory, story and fantasy. 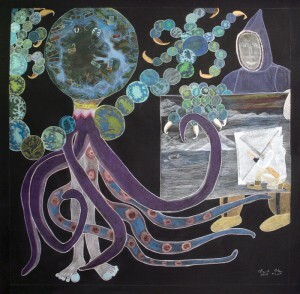 Over time, the emerging field against which these influences played out has been the rock strewn shore of Cape Dorset, which for millennia has edged and interacted with its own parallel and elemental marine universe. Incorporated onto pristine and extended white surfaces, favourite images such as tents have been connected by ink line and organized into precisely rendered coastal pebble and rock landscapes. Shuvinai’s elemental tent image has now transitioned from a simple sheltered protection that is connected to the landscape through an architectural organization of physical supports, to a world – a world that even utilizes botanical and imagination-conceived tendrils to link to her other world(s) for compositional strength. In Shuvinai’s compositions however, her world(s) never collide – they touch, they eclipse, and sometimes they simply and elegantly float in perfect harmony with each other, but always in sensitivity to nature. Shuvinai’s tendrils surround her world(s) in such a way that the eye is led around the image by these connections. Shuvinai has an intuitive sense of compositional elements, and they always rest securely in nature. Her world(s) are a floating and colour-infused metaphor for the centre of family life that is positioned on an axis in space and held in place through a galactic network of anchors and supports extending from within the larger community. One world has now become many for Shuvinai, and each represents the twin expanding universes of her external and internal creative explorations. The once flattened and extended white field against which the original, precisely organized ink line renderings were grouped and distributed, has now been replaced by a sky; a sky that is spatially but carefully worked in colour and balance and extended out to the image edge, much like the horizon of heaven.